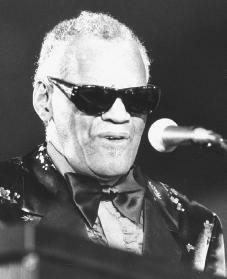 The African American musician Ray Charles was widely admired as a singer, pianist, and composer (writer of music). He combined elements of jazz, gospel, and rhythm-and-blues to create a new kind of African American music known as soul. Ray Charles Robinson was born in Albany, Georgia, on September 23, 1932. His father, Bailey Robinson, worked as a railroad mechanic and handyman; his mother, Aretha Robinson, worked in a sawmill and sometimes washed other people's clothes to make extra money. In his autobiography (the story of his own life) Brother Ray, Charles remembered that "The old man … was hardly ever around." The family moved to Greenville, Florida, when Charles was still a child. At the age of five Charles watched his four-year-old brother drown in a laundry tub despite his efforts to save the boy. Soon afterward Charles began to go blind. At the age of seven his right eye was removed, soon after which he became totally blind. He was sent to the Saint Augustine School for the Blind, in Florida, where he learned to read Braille (a system of raised dots on paper that the blind can use to read) and began to play the piano, clarinet, and saxophone. His blindness required him to use his strong memory for music and his gift of perfect pitch. At fifteen years of age Charles lost his mother; two years later his father passed away. The suffering Charles experienced, having gone blind and been left an orphan at an early age, gave his music added depth of feeling. After graduation from the Saint Augustine School, Charles traveled across Florida and performed with country and western bands. It was an experience that helped him later, when he added western songs to his performances. Shortly afterward he began touring with rhythm-and-blues bands, arranging and composing music as well as playing the piano, clarinet, and saxophone. In order to avoid being confused with boxing champion Ray Robinson (1921–1989), he dropped his last name and became known as Ray Charles. Charles grew tired of Florida and decided to use his savings to go as far away as possible. He wound up in Seattle, Washington, where he formed a band called the McSon Trio, which eventually had its own local television show. He also made several records for the Swingtime record company. In 1950 he moved to Los Angeles, California (where Swingtime was based), and continued to record and perform. As a singer, blues singers Guitar Slim (1926–1959) and Percy Mayfield influenced Charles. At the piano, the jazz arrangements of Lloyd Glenn influenced him. The influence of gospel music was always present in his style. Charles's singing of romantic songs continued in the smooth tradition of Nat "King" Cole (1917–1965), but was boosted by deep-throated growls and high notes that were often thought to be coming from a female voice. His strong voice, his mixing of styles, and his skill as a musician gave him international appeal, but for an English-speaking audience his storytelling power added something extra that made Charles stand out from other artists. In 1954 a recording session with Atlantic Records combined gospel with rhythm-and-blues and established Charles's "sweet new style" in American music. Charles used the forms of both gospel music and standard blues in recording such songs as "My Jesus Is All the World to Me," "I Got a Woman," and "Baby, Let Me Hold Your Hand." Charles referred to his invention of soul music as a combination of jazz and gospel. He continued to tour, spending most of the 1950s on the road. In 1959, on the ABC-Paramount label, Charles recorded his famous "Georgia on My Mind," which later became the official song of the state of Georgia. Charles won ten Grammy Awards from the National Academy of Recording Arts and Sciences. In 1976 he recorded songs from George Gershwin's (1898–1937) Porgy and Bess with Cleo Laine. A television ad for Pepsi in the 1990s helped make sure that Charles would be known to a new generation of music lovers. He also kept the albums coming, including My World, The Best of Ray Charles: The Atlantic Years, and Love Affair. He also appeared in films such as Ballad in Blue, The Blues Brothers, Limit Up, and Spy Hard. In 1994 Charles appeared on the NBC news show Now, admitting that "I'm probably going to lose at least a third of my fans," when he told interviewer Bob Costas (1952–) that Elvis Presley (1935–1977) had just copied what African American artists were already doing. "To say that Elvis was … 'the king,' I don't think of Elvis like that because I know too many artists that were far greater than Elvis." While this statement caused a stir, it was known that rock music, especially in its early years, was heavily rooted in blues. Many rock artists performed and became popular by playing music that originally belonged to African American blues singers. Charles is married to the former Della Altwine, herself a gospel singer, with whom he has three children. He is also good friends with Stevie Wonder (1950–), Quincy Jones (1933–), and other musicians. Yet there is always a feeling of loneliness in his music that is, perhaps, best reflected in his recordings with Betty Carter (1930–1998) and his recordings from Porgy and Bess. Charles put it best himself in a 1989 Downbeat interview with Jeff Levinson: "Music is my breathing. That's my apparatus. I've been doing it for 40 years. And I'm going to do it until God himself says, 'Brother Ray, you've been a nice horse, but now I'm going to put you out to pasture.'" Ray Charles also remains in the news for his generous donations to educational institutions. In 2000 he gave Wilberforce University in Ohio a two-million-dollar gift to fund music scholarships, and in 2001 he donated one million dollars to all-black Morehouse College in Atlanta, Georgia. Both universities awarded honorary degrees (received without having met the usual requirements) to Charles. Charles also appeared in Las Vegas, Nevada, in 2001 to promote a new line of slot machines that the Alliance Gaming Corporation had created for the blind to use. Charles, Ray. Brother Ray: Ray Charles' Own Story. New York: Da Capo Press, 1992. Lydon, Michael. Ray Charles: Man and Music. New York: Riverhead, 1998. Ritz, David. Ray Charles: Voice of Soul. New York: Chelsea House, 1994. Turk, Ruth. Ray Charles: Soul Man. Minneapolis: Lerner, 1996. Winski, Norman. Ray Charles. Los Angeles: Melrose Square, 1994.
i followed ray charles for a very long time and still listen to his music. my son even put the albums on cd.s so i could hear them at any time. what i wanted to know was didn't he have more than three children. and what do they all do now. ages would be nice also. As a youngster growing up (1950s)in Fifth Ward, Texas, I would hear people referring to Ray Charles as "Limber Knuckles"! Later, I learned that this was their way of expressing wonderment for his ability to play the piano! Even reading this article brought me to tears! He needs no title except genius anyway. He did have at least one child to another woman, whom he supported.